Pail & Mop Strainer Combination - 15 qt. WaveBrake Foot-Activated Mop Bucket Combo w/ Wringer - 44 qt. WaveBrake Mop Bucket Combo w/ Wringer - Red - 35 qt. 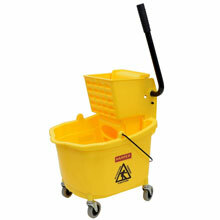 WaveBrake Mop Bucket Combo w/ Wringer - Yellow - 35 qt. WaveBrake Mop Bucket w/ Wringer - Brown - 35 qt.